Cherry's park is dwarfed by large new homes that replaced small bungalows. Homes in Cherry enjoy views of the uptown skyline. Cherry's park is well kept and attracts diverse residents. Large new homes dwarf smaller homes of long time residents in Cherry. Diane Powell's family moved to Cherry three years ago. She says, "When you’re raising kids who are also of color, Japanese American, you want to see a lot of diversity outside your door and in the park, the community and we’ve been able to do that here." The barber shop in Cherry is still open. The longtime grocery store next door reopened, after being closed for almost a year. 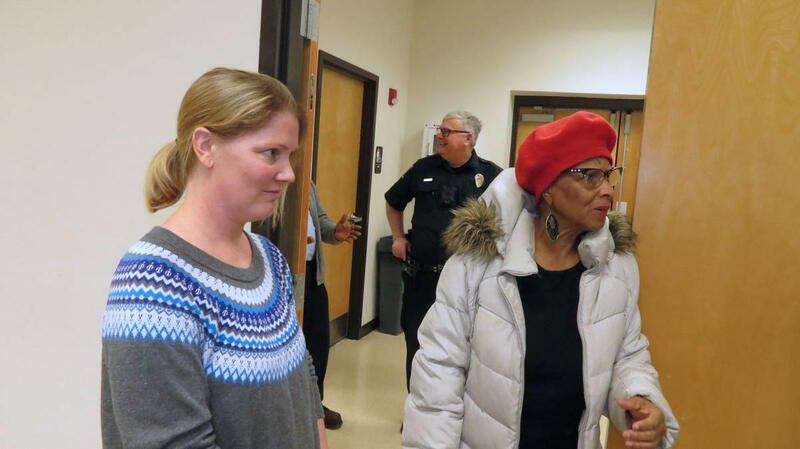 Some new residents did not want it to reopen or sell alcoholic beverages. Damu Gordon has owned the barber shop for 15 years. He says some of his displaced clients have come back to the neighborhood and his shop since the new affordable and low-income units were built in Cherry. Morgan School, a historic landmark, is not being used. Residents want to turn it into affordable housing or a community center. Large homes surround Cherry's park. Clyde Johnson said many of his friends in Cherry were displaced when their rentals were sold and razed to make room for the new homes. Vice president of the Cherry Community Organization (CCO) Barbara Rainey cringed as she remembered her birth home being demolished. Rainey has lived in Cherry for 68 years. Barbara Rainey,left, vice president of the Cherry Community Organization and CCO President Virginia Bynum. Longtime Cherry residents say they have had to let go of a lot, including for some, the ability to afford to stay in the community that they love — a 100-acre community that was developed in 1891 to promote homeownership for working-class African-Americans. Cherry is located a mile southeast of uptown. Many of the homes have panoramic views of Charlotte’s skyline. It is those views and Cherry’s closeness to uptown that attracted developers and high-income families. The displacement of those who couldn’t afford to stay has resulted in Cherry going from 66 percent African-American 25 years ago to about 57 percent white today. “Some neighbors have embraced us and some came in wanting change, didn’t want the neighborhood store that just reopened and has been here forever to sell alcohol beverages,” Rainey said. New 81-unit, low-income apartment complex being built in Cherry to replace older, smaller income-restricted apartments. She said a few new residents wanted to immediately be on the Cherry Community Organization’s board after they moved in. “Some feel they should be able to do that, just take over,” Rainey said. So tensions have been high in Cherry. Some longtime residents accuse white residents of calling the police on them when walking on streets near the newer homes or while playing basketball in Cherry’s park. Two of the few older homes still left in the Cherry community. And there are complaints from some new residents that the black residents are at times too loud, often talking to each other from different sides of streets. But Jacobs, a former member of WFAE's board of directors, has known people there for years. She said she always wanted to live in Cherry because of the neighborhood’s history and the closeness of its residents. She said a few complaints about behavior in the park may be warranted when outside residents come to play basketball but thinks most are exaggerated. “To give you an example, it’s been a tradition here forever on the Fourth [of July] for neighbors to go to the park and light fireworks and I saw on Facebook a lot of complaints from some newer residents saying ‘How long will this go on? It’s so loud,’" Jacobs said. "Well guess what, that comes with the neighborhood. Get over it." Jacobs said she’s friends with new and old residents and said there are newcomers who appreciate Cherry’s history and its diversity, such as Stephanie Gardner. Her family moved to Cherry last summer. So does Diane Powell, who moved with her family to Cherry from Myers Park three years ago because of Cherry’s economic and racial diversity. Older residents say they are resigned to the changes in Cherry but what hurts is how they got here. Cherry began to decline in the 1970s and a lot of the properties ended up in the hands of absentee landlords who didn’t always keep them up. CCO officials bought more than 100 homes through a loan from the city during that time. They kept rents low but the organization was pressed financially. About 15 years ago, about 90 of the CCO homes were sold to the StoneHunt development company below market value in exchange for promises that affordable housing would be built on the land for Cherry seniors, disabled and low-income residents. Only 42 senior citizen units were built at the Cherry Gardens apartment complex. Much of the rest was sold to other developers, who built luxury homes on the sites. CCO officials sued and last year, the court ruled in their favor but StoneHunt filed for bankruptcy, leaving the multi-million dollar judgment they planned to use for affordable housing up in the air. Charlotte’s Housing Director Pam Wideman said the city is sensitive to Cherry’s affordable housing needs and is responding. “What you are starting to see now alongside the newer homes is some of the affordable development being built there," Wideman said. "The architectural style was intentionally designed so it reflects the older character of the homes. The older neighborhood residents were adamant about that." Wideman points to the $1.2 million the city approved for the Charlotte Housing Authority to tear down a smaller, older low-income complex in Cherry and build 81 affordable units at the site. The city has also partnered with Laurel Street Residential to build 30 income-restricted units on city land in Cherry. “That’s really important because when you think about who needs affordable housing, you look around Cherry and you have lots of the service industry there, retail, the hospital," Wideman said. "It’s important for people who work in those facilities who are lower income earners to have the opportunity to live close to where they work." There has been talk about turning Cherry’s Morgan School building, a historical landmark, into affordable housing. The charter school there closed last year and it’s currently not being used. City Councilman Larken Egleston, who represents Cherry, said the city could step in to preserve that piece of Cherry’s history. City Councilman Larken Egleston represents the Cherry community. He says new affordable housing being built in Cherry will make it possible for those displaced to come back. “I hope we can find a long term preservation strategy for the Morgan School in a way to reactive it and make it something that benefits all in the community,” Egleston said. “It’s very much the heart of Cherry and if we were to lose that building, that would be the final straw that they let Cherry go." Rainey, of CCO, said she "doesn't know what the future holds" but knows that there will be "bigger and better things for Cherry." "I think Cherry will come together and we will get what we need and live in a peaceful setting that everybody loves,” Rainey said. And change slowly happening with longtime and new residents organizing a book club and panel discussions on the history of Cherry. 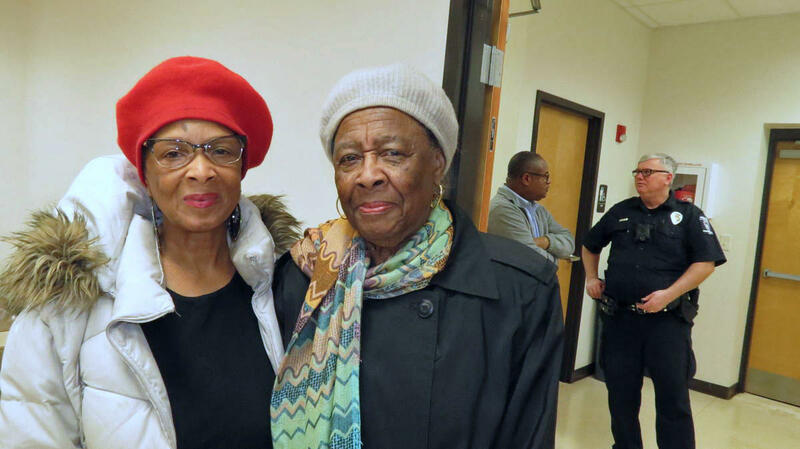 They also successfully worked together this month to get the Charlotte Area Transit System to reinstate the bus stop in Cherry — a victory that stemmed from a united front. This story is part of WFAE’s Finding Home series, our weekly look in 2019 at the housing challenges and changes throughout the Charlotte area. Charlotte is changing. What else is new, right? The city’s population is now above 800,000. Mecklenburg County’s population has doubled in the last 25 years to more than 1 million people today. But change is about more than the growing numbers of people. Properties change hands and so does their value. Buildings get torn down. Sometimes, the entire fabric of a neighborhood changes – and the people who lose out the most are the ones who can least afford it. Today, WFAE begins a periodic series in which we’ll visit neighborhoods going through change, big and small. Our series is called Block By Block. Mixed-use project planned for Cherry neighborhood voted down by city council because of height and density. Charlotte’s city council members gave a thumbs down to a proposed mixed-use development in the historically African-American Cherry neighborhood.